Serge Hochar's father established a winery in the castle of Mzar north of Beirut in the Bekaa Valley in 1930. Serge gained much experience at Chateau Leoville Barton, so it is not surprising, that the red wine of Chateau Musar resembles a fine Bordeaux. It is blended from various proportions of Cabernet Sauvignon, Cinsaut and Syrah planted on the slopes of the Bekaa Valley 30 miles further east and is capable of many years bottle maturation. A fairly normal winter followed by a fresh spring with no hail or frost and then a mild summer with a very cloudy and fresh August followed by a sunny September. These perfect conditions allowed grapes to mature slowly and surely at a pace rarely. The harvest started on the 15th of September and ended on the 11th of October for the reds. However harvesting had to stop for about 4 days starting on the 30th of September because of rain. It was the slowest and best fermentation they had at Chateau Musard and by the 30th of September 805 of the harvest was in the cellar. The wines were tasted on the 18th of November. Almost all malolactics were finished and wines looked ready for drinking. Very beautiful wines and even the whites were as good as the reds. 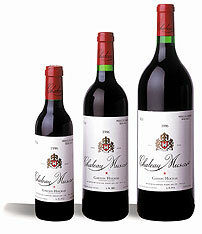 All wines are big and very perfectly balanced whatever the cepage. Cabernet sauvignon, Carignan, Cinsault, Merwah and Obaideh. Definitely a Vintage to follow very closely. Mr. Serge Husar – November 1997: A rich, warm deep cherry red with smoky nose full of spices and fruits. On the palate there are mixed berry fruits – cherries, redcurrants, pomegranates and Christmas spices of cinnamon, nutmeg and cloves. Good acidity with good tannin levels results in a wine of classic structure with long ageing potential. Simon Hoggart – The Spectator Febr. 2004. Andrew Jefford – Decanter Magazine Jan. 2004.